Don’t worry if you’re just starting out on your employment journey and don’t have any previous experience; we all have to start somewhere! Many employers are taking on school leavers and are less interested in experience than they are in commitment, enthusiasm and a willingness to learn. Using positive experiences from your school career or extra-curricular activities can go a long way in showing potential employers what transferable skills you have to offer them. I am writing in response to your advertisement for the above post, and am attaching my CV for your information. Having just left school I am starting out in my career but I have a wide range of skills and experience to offer you. I was captain of my netball team for the past four years, which enabled me to develop strong leadership skills and the ability to think quickly on my feet. I also undertook the Duke of Edinburgh Scheme where I took part in a range of activities including teaching children to swim and supporting elderly residents at a local care home. I get on well with others and have always excelled at team based activities, although I am also studious and able to work well on my own initiative with minimal supervision. I really enjoy new challenges and am a very fast learner with good problem solving skills. 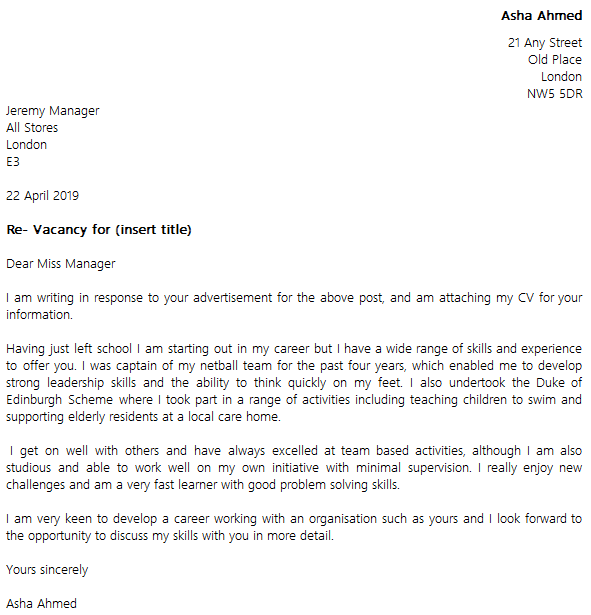 I am very keen to develop a career working with an organisation such as yours and I look forward to the opportunity to discuss my skills with you in more detail.